And The Legal Genealogist is one of those 49.8 million Americans — a first-generation American on my father’s side, as a matter of fact. My grandfather hailed from Thüringen, a place where research is good news-bad news. The good news? It wasn’t much affected by World War II; any records that ever existed should still exist. The bad news? Ain’t nobody gonna microfilm those records in my lifetime. My father and his mother, however, were born in Bremen — Germany’s 10th largest city, with something more than a half-million residents in 2010.2 And although Bremen had the stuffing bombed out of it during World War II3 and many records were lost to the bombing,4 there is one website in particular that’ll bring a smile to the face of anyone with ancestors from Bremen. It’s the website Die Maus — for die Gesellschaft für Familienforschung e. V. Bremen — the Bremen Genealogical Society. Some of the website information is for members only, but it has tons of information, mostly in German, available to anyone, member or not. The information that’s most useful is generally in the online databases, accessed through the link on the left labeled Online-Datenbanken. One database that’s been extremely useful to me is the Leichenbücher 1875-1945 — these are the burial books for three major Bremen city cemeteries that operated after December of 1874: Walle, Riensberg and Buntentor Friedhöfe (cemeteries). Each entry records the book and page of the entry, together with the number of the death record at the City Registrar’s office, the person’s last name, maiden name if any, first name, the name of the person who arranged the burial, the date and place of death, the date of burial, which cemetery, what gravesite and what class of burial (how fancy a burial, which dictated how much it cost), the age at death and relationship to the person arranging the burial. Because records after 1875 haven’t been microfilmed, these cemetery book entries are worth their weight in gold. The entry in the image to the left (click to enlarge) is the entry for my great grandmother, Juliane Margarethe (Smidt) Nuckel, wife of Carsten Hinrich Wilhelm Nuckel, who died 27 January 1907 at 15 Hardenbergstrasse in Bremen, at the age of 42 years and two months. She was buried on the 30th of January at the Buntentor Cemetery in grave site 1952. Her fourth class funeral meant that her body was brought to the cemetery in a hearse drawn by two black horses and driven by a driver dressed in black with white cravat and cornered hat, with eight black-clad attendants wearing cornered hats. It cost on average 35 marks. The years covered by the database have increased steadily, and non-members can now access burial entries through 1939; members get access through 1945. When the 1920 records went online, it meant that, for the first time, I was able to get the death information for my grandparents’ only other child. Marie Emma Geissler died at the children’s hospital in Bremen on 20 January 1920 at the age of four months and 10 days. She was buried three days later at Walle Cemetery. More recently a database has come online with entries from the records of the great St. Peter’s Cathedral (Bremen Dom). While — like the funeral books — it doesn’t replace the original records, it’s a great way to get the information needed to focus on specific records. For example, I knew that my 3rd great grandfather Johann Heinrich Hüneke was born around 1803 in Bremen. This database told me he was born on 4 April 1803 and baptized at the Cathedral on 11 April. And it gave me the name of three siblings I didn’t know about, together with their baptismal dates. Talk about a guide to which microfilm to order! Hard to beat. And there’s more — much more. Gravestones. Passenger lists (available in English). Citizenship applications from 1608 to 1811 and from 1855 to 1900. A list of Bremen residents in 1812. Wills between 1599 and 1899. Taxpayers from 1638 to 1668. Those are just a few of the databases. Yes, you will need some German, but not much. Like the civil registration records I wrote about back in June,5 you don’t have to be fluent in German to work with this website. Knowing the key words (geburten = births and heiraten = marriages, for example) will speed up your work, but working through the text word for word with a dictionary (or using Google Translate or some similar tool) is definitely do-able. Besides, how can you go wrong with a website named for a mouse? 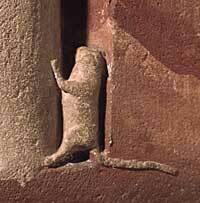 Especially a mouse that guards the Bremen cathedral from witches, devils and other evils! I know this post is several years old, but I just wanted to say thank you for this! I’m starting to research my grandmother’s history in Bremen during World War II and your summary Die Mous will be very helpful! I am trying to research my fathers history, which is proving to be very difficult. He was born in Germany and I believe his father died in Bremem. I was told most of his family records were sealed. I am hoping Some of the information you have listed will help.